Go to the Insert tab on the ribbon, click the Audio drop-down arrow, and select Audio from File. 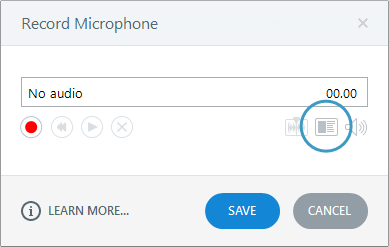 Tip: If you're in Form View, go to the Question tab, click the Audio drop-down arrow, and select Audio from File. Go to the Insert tab on the ribbon, click the Audio drop-down arrow, and select Record Mic. Tip: If you're in Form View, go to the Question tab, click the Audio drop-down arrow, and select Record Mic. 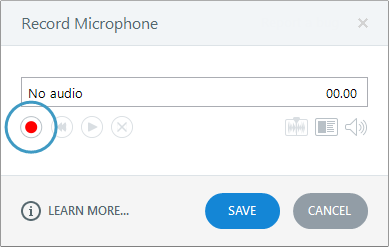 If you want to edit the audio you just recorded, click the Edit audio button to launch the built-in audio editor. To learn more about editing audio, see this tutorial. When you import slides into Storyline from Microsoft PowerPoint, Articulate Quizmaker, or other Storyline projects, audio resources from the external content are also imported and available for editing. Tip: You can import Articulate Engage interactions, but their audio resources can't be edited in Storyline.